As some of you already know that most of my works are about my life experiences and pretty much a diary of my life. Although at times, a story comes by and I simply can't resist but paint the image that is inspired by a certain person and her story. This particular painting is named Courage ( painting above ), she is inspired by a girl named Bonnie. 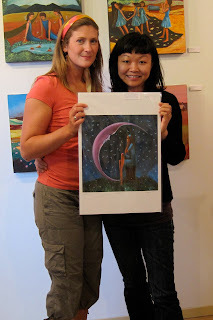 A couple years ago I met Bonnie at my Art Rush Gallery, Bonnie seemed lost at that time and was intrigued by my work. 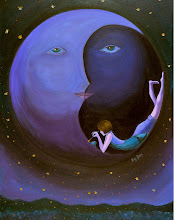 She was quite enthralled with my Metamorphose and Becoming paintings, which are about the power of our minds. The stories explained that if we learn to master our minds we can recreate ourselves over and over again and that we should always focus on the joy instead of the fears. Bonnie bought a couple cards that day and went home. A few months later, I received a heart felt letter from Bonnie that says" How you have changed my life", Bonnie explained with much sensitivity how her old life wasn't serving her well anymore and after meditating on the cards that she has brought home, she abandoned her familiarity and explored her new world with courage and determination. Furthermore, she regained her strength and found true ha ppiness. I was amazed on how a person that I met for five minutes could inspire me like the way she did. I guess we both inspired each other, her with my art work and me with her courage. 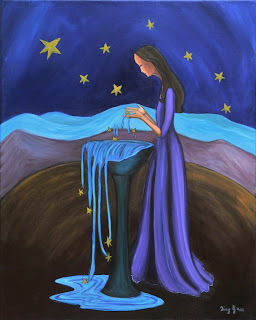 Hence Courage was painted, after the painting is completed I emailed Bonnie and told her about how she has inspired me as well. We met up that summer and became friends. 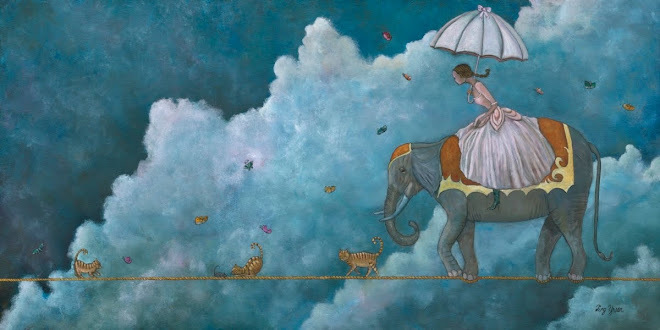 Since the original of Courage was sold before she had the chance to see it, Bonnie bought the limited edition print of Courage instead, and seemingly happy with it. I am so glad that Bonnie and I met because she is very much like a soul sister, she is kind and gentle on the outside but she has a mighty heart that is so courageous and open. I believe a heart like hers can only attract good things in her life. Now, a little about the girl that inspired me, Bonnie is originally from Cape Breton Island, Nova Scotia, Canada. She moved to Williams Lake, British Columbia about two and a half years ago. Nomadic life style was her way of life, although after discovering British Columbia she fell in love with the nature of the place and it brought back memories of riding horses in a childhood. Since she is a lover of nature and the energy that it provides, setting her roots here in British Columbia was the ultimate and most natural thing for her to do. After a long and difficult moment of metamorphosing, Bonnie bought a horse and developed her skills as a rider. 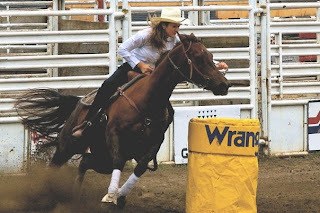 Bonnie devoted her love to the joy of riding and became a rodeo star. The stars are definitely with her during her moment of transition she met many wonderful friends and became enlightened by life and love. If you wish to know more about Bonnie , please visit her blog, she is an amazing writer and I believe she definitely has a future in story telling and recording her life journey with humour and heart. Here are some pictures of Bonnie and her horse and Bonnie and I in my gallery. Alas, Art Rush Gallery is open for the Season! It's been a long and productive winter. 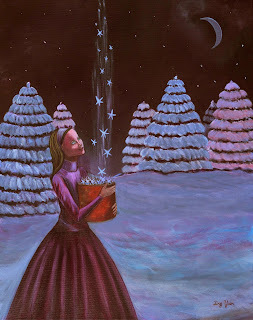 Winter is my creative time, my gallery is closed for the season and I get to paint my new collection. Other than my painting schedule, my husband and I also love to escape into the meadow for a little cross country skiing. Unfortunately by mid March this year, I had a horrific ski accident and broke my ankle resulting in a short ski season but my painting continued. In the five months of hibernation, I painted a collection of new work, 22 in total. 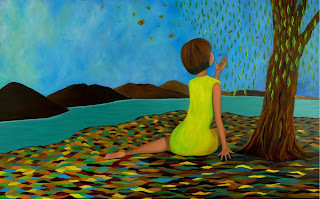 The painting above is called Gratitude, this was the first image I painted after my accident. I was grateful that it wasn't my wrist that I broke because I could still paint and I was also thankful that my husband was able to help me through this difficult time. On May 22nd, 2010 our gallery : The Art Rush Gallery is now open for its fourth season. I am still hobbling around but am getting things done despite the pain of the injury. Now, almost four weeks since the opening, I have reconnected with some of my regulars and have had the pleasure to meet new acquaintances. Some of my new paintings have also found good homes which pleases me. In a week or so, I will have my new collection on my website as well as on my online etsy shop. Running a gallery is a lot of fun but it sure takes a lot of hard work, determination, persistence and a little courage. I am living my dream and it's my aspiration to remind everyone to take the plunge and create your own destiny. 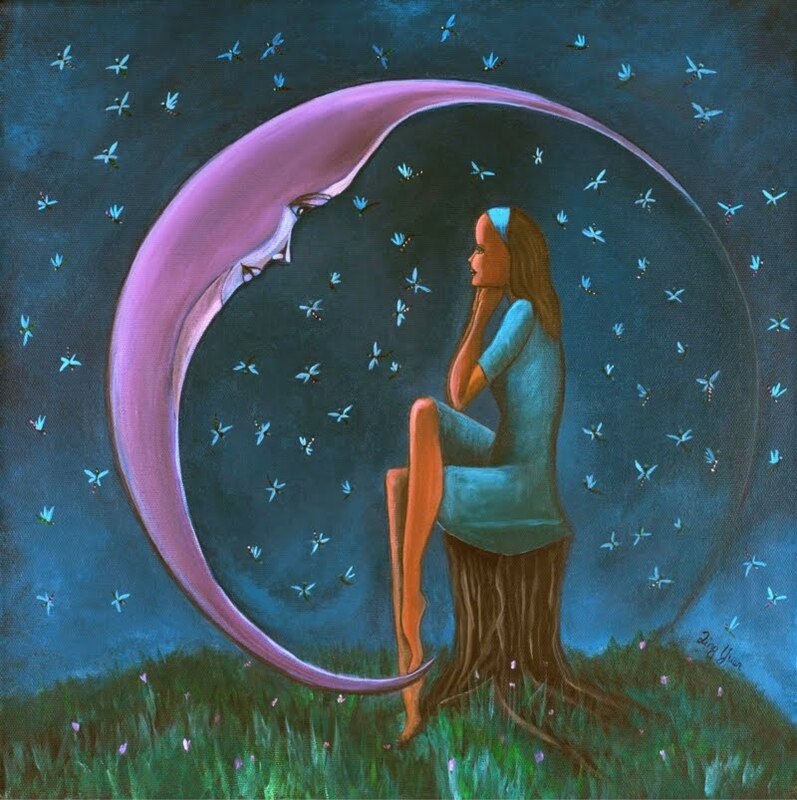 I would love to hear from you, so do leave me a comment and share your dream with me. All Images and content are the copyright of Ting Yuen. I have been working up a storm, painting my new collection for 2010. 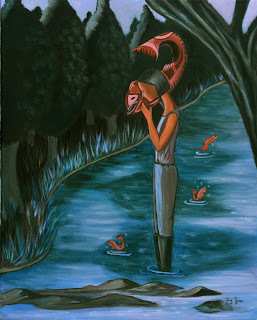 The collection is coming together very nicely, I am thrilled with the paintings and can't wait to share them with you. But first, I have to finish the collection slate for May 15th and then my husband, Paul is responsible for taking the pictures so that they are ready to be showcased !! I can't wait!! I believe to be a great artist, one needs skills, imagination and references. The mentioned three factors are how all my works are executed. If you wish to become a full time artist, start practicing your creative skills. I am self taught therefore I learn from books and most importantly I learn from my trial and errors. Without a doubt the best way to improve your skills is by consistent practice and observation. Through practice I gain confidence and from there it sets me free to explore and experiment without fear. The above left painting is called Belonging painted by myself, please click here to read the story. I remember when my husband and I purchased our dream gallery set in the most quaint country village of Wells. I didn't have enough paintings to hang on our gallery's walls. That winter I gave myself four months to paint 30 paintings. I let go of all my inhibitions and fears and I set myself free to paint feverishly. I was astonished by how much my knowle dge could carry me through and I was in awe with my confidence. One of the things that set my confidence to a different height was that I gave myself permission to destroy any of my images that I wasn't thrilled about. In the end I only threw out one canvas and ended up with 27 images and they were ready for showcasing on the opening day of our gallery! I was proud and so was my husband! Now after 4 years I am on my 4th collection, my paintings have developed and matured over the years. They now have more finesse than ever and definitely more details. My collection became smaller but stronger. The wonderful thing about honing in on your skills is that it sets your imagination to new heights. I constantly dream up of new images for my paintings. Imagination may come naturally for some of us but others may struggle with it. 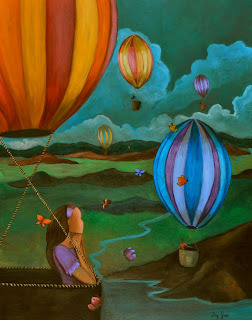 I believe imagination can be trained, thinking creatively can be pursued through pushing the boundaries of your thoughts. For example, let's say I would like to paint an apple in an expressive manner, I may decide to put the apple on the table or in a bowl or on a chair, but so far I find that all these images seem predictable........so how about suspend the apple in mid air with a pair of wings...?? As you can see, from this simple practice of broadening my thoughts, the apple became not just an apple anymore, it became an interesting riddle. 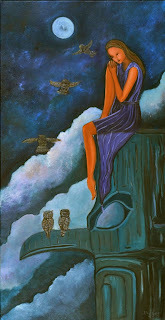 The painting on the above right is called Wisdom painted by myself, please click here to read the story. I also love to use reference pictures for my subject. Let's go back to the story of the apple, if I were to paint an apple, I may have many pictures of all different kinds of apples next to my easel, different types and different colors, these pictures not only provide me with more choices but they also assist me in getting the shape just right! I also use an amazing recipe written by one of my favorite painters Robert Genn. This concise recipe helps me to paint efficiently and thoughtfully. I believe you will like it too. Please click here to read about it and do use it for your art work. Before I finish off, I would like to thank you for reading my blog and for leaving me your comments. I have enjoyed reading them! There is more to Believing in your dream than the act of " A leap of Faith ". I do agree that faith has a lot to do with my dream, I trust the Universe wholeheartedly and responsibly when I share my gift with the world. Although what got me started was of course the love at first sight with my craft. All I knew was how deliriously happy I felt when I was painting and how absurdly annoyed I was when it wasn't going well. All these wonderful passions that I fell in love with prompted me to want more and that is what set everything in motion. The painting above is called Journeys painted by myself, you may check out the story of the painting by clicking here. Now with the realization of my dream, I figured with all those inspirations, it will not be fruitful without careful planning. So I bought myself a little black book and I wrote all my goals down to become a full time artist, I then gave each of my goals a time span of when and how I would like to execute them. From there, I planned out what I would like to accomplish each month. Now, a little advice: It's best to review your monthly goals daily but I tend to do mine bi-monthly which usually ends up with me cramming a few things all in a day or two because I was way behind schedule due to my reclusive painting time in my studio. After my great accomplishments of catching up I cross them off my list, whatever seemed impossible to get done for the month gets put on the next month list. Remember in order to avoid such rude awakenings and stress in your life, review your itinerary daily! I believe I need to set an hour a day to deal with my business part of my goals, remember living your dream as a full time artist is not all about studio time, a large part of it is business. The painting above is called Paradise Found, painted by myself, you may check out the story of the painting by clicking here. Goal setting and strategising means hard work, determination and persistence and the partner in crime is "Faith", I know somehow the Universe takes care of me and my dream but I also need to work laboriously to do my part in the success of my art career and always remind myself to stay focused and be grateful. To be a full time artist may sound like fun, but it is a business and you need to commit to your dream with all your heart, mind and hands. Create constantly, own your craft and remember to learn continuously and grow as an artist. My next blog will be the Part III of To be a full time Artist, I will be touching on the topics of Art Recipes! If you wish to share your stories of success with me or if you have any questions, I will be delighted to connect with you. Follow your Dreams: Be a full time artist! Today I am going to talk about following your dreams. My dream was to become a full time artist. When I started painting eighteen years ago, I found a true love and connection with creating art. It was a feeling of excitement, passion and unbelievable contentment. Sure these are all feelings that I have had in life itself, but painting is different, it's a solitary act, sometimes I even feel completely self indulgent and the feelings that I mentioned are self fulfilled. I think that's what makes me want to do it more and more......being self reliant on happiness may be the best gift you could give yourself. 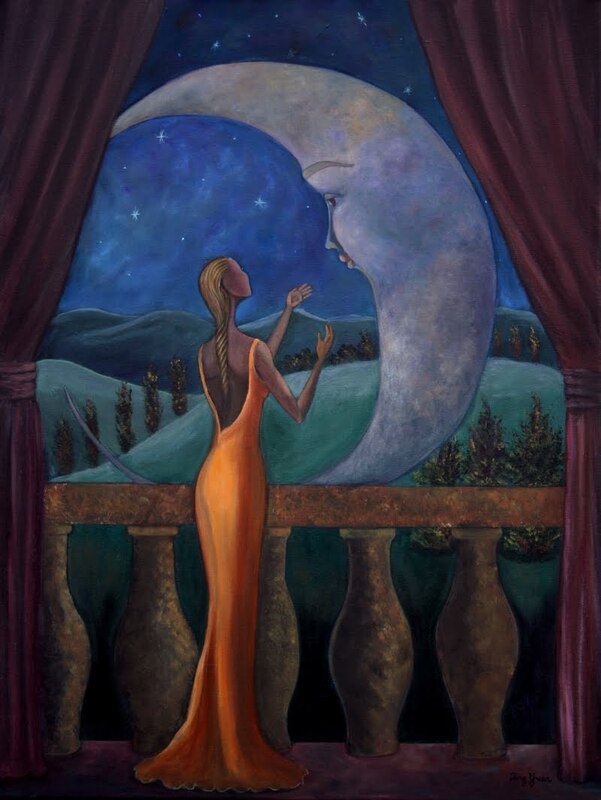 The Image above is called Wishes Granted II from my 2009 Collection. I started selling my art work in 1999, it was an immediate validation when I sold my first painting, I knew this was what I wanted to do forever, not just part time, not just on the side but really commit to being a full time artist. I was working in a restaurant in the Cayman Islands at the time, and was very fortunate because I only worked nights, so my days were free to explore my passion. Every morning, I got up and went to my studio and painted, I dabbled with paint, read books about painting, dreamt about painting and most of all I believed in my dream! The image above is called Persistence from my 2008 Collection. The picture above is called Inspirational Well from my 2008 Collection. I can't stress the importance of believing in your dream. Sometimes, it's just about putting a wish out there to the Universe, putting a wish out there somehow grants you the permission to make it a priority. I read books about artists, I dreamt to be just like them, I knew I could be just like them. It's important to know that we all have the power to be whomever we wish to be, we all have a higher self and all we need to do is trust HER (mine, is a female!) . Next, learn your craft, own it, practice it and learn to observe. 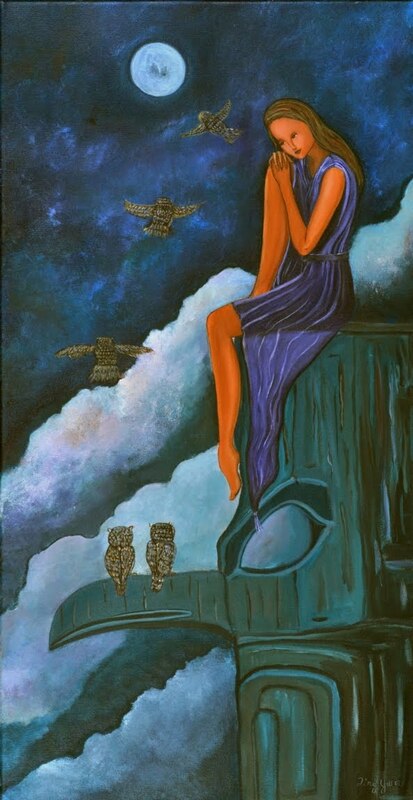 Observation is the key to the way I work, since I am a self taught artist, I learn to paint by trusting my intuition, you know the term "Read between the lines", well it's very much like that. Learn to talk to your painting, learn to see it in the reflection of a mirror, look at it upside down, sideways and so on. Stand on your head if you have to, but study your work. Have a recipe list that works for you. I will talk more on this topic on my next post. Oh! Take workshops, read books and practice practice practice!! Now, this may not be the best part about being a full time artist, but it's one of the most important topics: Business! You can not be a full time artist if you do not know how the business side works, read as many topics on business related subjects as often as possible. One of best gurus when it comes to art business is Alyson B. Stanfield, or if you are publishing your own prints, do check out Barney Davey's "How to Profit from the Art Print Market". These two gurus have a whealth of information that can't be missed. Remember to practice on how to talk about your work, I remember when I first opened my gallery, I was so afraid to express my work to potential clients, but since I needed to make a living, I learned to talk about my work Really Fast. As a reminder, no one is capable of selling your work better than yourself, and no one is in charge of your destiny but yourself. So sit down and write a list about why you paint and what it is that you paint. Anyway, I have chatted long enough and obviously I can continue if need be, but I think I shall leave it for next time. BTW all the paintings that I have here on my blog have stories that accompany them, you may read the stories on my etsy shop. If you wish to know more about "following your dreams" or if you have a similar story that you wish to share, please feel free to leave a comment, I would love to connect with you. I paint predominantly with acrylic on stretched canvas. I enjoy working in series, my four main series are: The Artist Diary, Romance, Sisterhood and Season. Furthermore, each of my images comes with the related story that tells you the inspiration behind that particular painting. Please take your time to view my work and I hope you'll enjoy them ! 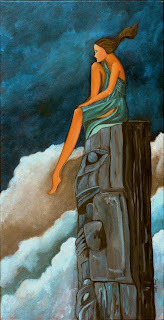 The above painting is called A leap of Faith, it is part of the Artist Dairy Series. A Leap of Faith is about the trust that we surrender to the Universe. 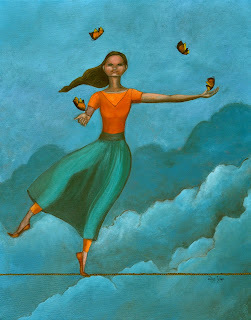 In this painting, the girl is balancing on a tight rope, juggling butterflies in the air with her eyes closed smiling with confidence believing that somehow the Universe will protect her from harm and that in good time everything in her life will manifest it’s beauty. 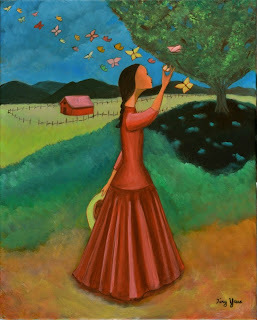 I painted A Leap of Faith because I am always amazed how powerful faith is. It may be all we need to ease the fear of the unknown. In many ways Faith is like prayers answered. 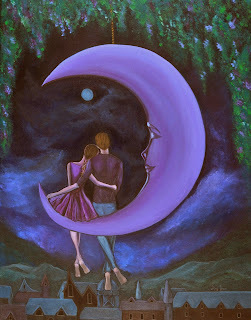 The painting on the right is called The Moonlit Chat, it is part of the Romance Series. Moonlit Chat is about the importance of communication in a relationship. My husband Paul and I spend a lot of time together in both work and play and we are always chatting up a storm. We dream up new adventures and reminisce the past. The secret to good communication is trust, respect and putting our differences aside. Through our long conversations, Paul and I have learned to work through our differences and to use the challenges in our lives to strengthen our relationship. I love chatting with my best friend because it helps us to re-connect over and over again. The painting on the left is called You've Got Mail, it is part of the Sisterhood Series. communication. My sisters and I live far away from each other but we are constantly in contact through the magical convenience of email. 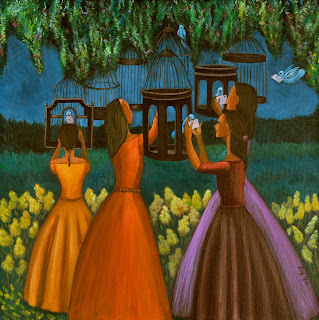 In this painting, all four girls are receiving their mail at the same time which symbolizes our group emails, sometimes some of these conversations may last for days. I love our group emails because it helps us to keep in touch despite the distance. The painting on the right is called Winter is part of The Seasons Series. 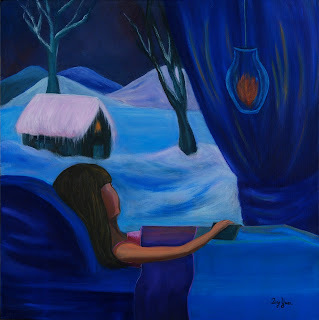 In this painting, I have painted a girl laying in bed watching the snow covered scenery and enjoying the beauty of winter. Winter for me is a time of rest, relaxation and gathering of energy. All content and artwork are the copyright of Ting Yuen.